The information below contains general information on the different types of products we stock, along with some details of both our own and other customers personal fishing advice, tricks and tips. If you use our products and wish to provide further advice to help and assist other fishers / anglers, please feel free to contact us with your information. The articles on this page are not a guarantee of any sort, but simply beginners advice for you to gain general information and for you to consider others opinions (if you wish) when starting your early fishing experience, which will hopefully make the road to catching fish a little bit easier and may assist you in forming your own personal fishing techniques. When purchasing spin lures and hard body lures below 4 grams in weight, we highly recommended that you own (or purchase) a high quality spin rod. High quality spin rods are usually identified by a rating known as the "Lure Cast Weight", this is a range in grams that determines which lures the rod is designed to use. You will have no problems using a rod with a minimum lure cast weight of 1 gram, a maximum cast weight of 6 grams or more will ensure compliance with most spin lures on the market today. This rating is not limited to spin lures alone and can also guide you when purchasing hard body lures and soft plastic lures within the rods weight range. Some rods may have a minimum cast weight of 2 grams, which is also an acceptable amount for most lures on the market. Rods with lure cast weights over 2 grams can also be extremely good, but you will need to remember to check the weight of the lure is over the minimum weight your rod will accept, otherwise it will be difficult to use the lure correctly. Spin lures are a weapon of choice for most when it comes to fishing for trout and redfin (european) perch. Australian native Golden Perch (Yellow belly) are also known to take spin lures, however most people tend to use hard bodies. Spin lures should not be confused with other spinnerbaits, in our store, spin lure means the in-line variety of spinnerbaits. 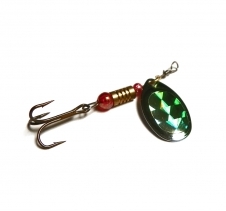 Other spinnerbaits contain an outer spinner which is usually circling around a separately attached soft plastic lure. An in-line spin lure is different as it contains a thin metal rod down the centre, usually attached to this is a few small round plastic or metal balls, with a solid sliding central section which the balls will tap on during movement. At the top, a spinner (also known as a blade) is attached to the central rod which quickly spins around the outside when travelling through the water. 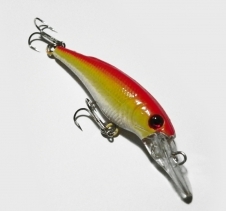 Other in-line spin lure designs remove the need for the sliding balls and solid moving centre by using a bell shaped design, inside the metal bell casing is a piece of brass which commonly appears similar to a mechanical gear. As the lure moves through the water, the outer bell and inner gear come in contact producing a noise different to the other type of in-line lure. On top of the metal bell can be a single small brass ball which comes in contact with the bell casing producing further noise and water disturbance as the lure travels. Some designs replace the top ball for a small arch shaped piece of brass, which dissipates water on a sharper angle producing a different type of water disturbance to attract the fish. The way these lures normally work is the central in-line items will generate noise and water disturbance when travelling in the water, while the outer spinning metal blade circles very quickly around the centre of the lure, generating strong vibrations in the water along with a look that resembles a fish (or something edible) to species such as trout and redfin. Why trout and redfin love these lures is unknown, as not many other species will accept them so readily. In my experience, when fishing with slightly heavier general rods or lower quality spin rods, the heavier lures (4 gram and over) work very well. However, when you use a high quality light spin rod with light line (~7lbs), the lighter spin lures work extremely well and allow you to perform actions with the lure which would normally be very difficult when using lower quality spin rods or a heavier / large / fairly solid fishing rod. With a proper high quality spin rod, you can also perform better actions with heavier lures, an added benefit is also a very large casting distance, a proper spin rod means the lures will travel much further than when using unsuited or lower quality spin rod. For information on how to identify quality spin rods, please refer to the "Using the right equipment" section at the top of this page. Differences between the bell shaped lures and shaft based lures is marginal, I tend to prefer using the bell shape to begin with but I have caught fish using straight shaft based lures with no noticeable difference in hook up rates or follows. Both are extremely good, the performance itself will come down to the quality of rod and line you are using. They don't call them spin rods for no reason! Using a spin rod and quality reel / line will greatly enhance your chances of getting a catch using spin lures, more so than the colours or design of spin lure you purchase. Most importantly, learning how to vary your returns will provide much of the skill you need to catch fish regularly, not only on spin lures but soft plastics and hard body crank type lures too. Once you have the right gear and are confident, then it is worth trying out the different colours to see if you notice any difference. Personally I've caught trout on basically all colours, from reflective rainbow coloured spoons, to general flat colours and even plain silver / brass coloured lures. Redfin when fishing in clearer waters are pretty much a hit on any colour combination too, some people however swear by mainly red or red / black combinations. In murky / muddy / darker waters I tend to prefer using a brighter lure, in rainbow type colours to get their attention quicker, reflective rainbow colours go for trout too in these water conditions. Every fisher has their own preference when it comes to colour combinations, so take this only as beginners advice, as you progress and your varied retrieves get better you will become confident in varying lure colours and finding favourites yourself. While these lures can work on some other fish, they are mainly the choice of trout and redfin fishers due to the large success of catching these species using spin lures. The purpose of hard body lures is to appear to your target fish to be an actual live fish (or for some designs, a type of insect or baby reptile). The benefit of using hard body lures is that most fish will attack these lures, as opposed to spin lures (in-line spinnerbaits) which are most effective on various trout and perch species. 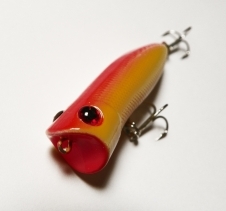 The two main types of hard body lures are known as crankbaits and poppers. It is common when fishing using hard body lures to sometimes see predator fish following the lure, and in perfect cases striking the lure at the surface of the water and (hopefully) grabbing the lure (hooking up). Hard body lures generally have a painted or imprinted colour and/or design, in some cases this can appear to resemble a natural food of the aquatic environment. However, many very effective hard body lures have a design or colour unlike anything seen in the local waters. Pink for example is well known for being a highly popular and successful colour for many different species, including but not limited to yellow belly (golden perch). Pinks / Yellows are also known to be productive with Australian Bass along with many other fish. When talking redfin (european) perch, some people report having a lot of success with pink lures, however in my experience redfin will hit almost anything when your lure gets their attention and they think it's alive. Dark vertical lines on some hard body lures are added to further assist in baiting the target fish, the darker lines help to break up the unnatural colour of some lures in order to assist the target species into accepting the lure as being a real and meal sized fish. In situations where fish are following or approaching unnatural coloured lures but won't bite, using similar colours with dark vertical lines may help turn results in your favour. In saying this, sometimes vertical lines are not required and the fish will happily accept a lure without them. Many people also recommend brightly coloured hard body lures when the water is murky and visibility for the fish will be low. While this makes sense, fish respond not only to sight, but also vibrations in the water and sound. Sound can be detected by fish not only by our own audible sound but also by vibrations / movement in the water. Some hard body lures also contain ball bearings which move around inside a hollow section of the lure. These lures work on the purpose of adding a quick tapping / clicking sound in order to further assist detection by the target fish. There is no absolute formula for the perfect lure colour or action, it depends on a lot of factors, by trying different lure colours, lure styles and varying then perfecting your lure retrieves, you will begin to understand more regarding the fish you are targeting, will be able to assess different styles and colours based on the water conditions, and following this find the best way for you personally to catch your target fish. Crankbaits are the most popular hard body lures, the aim of these lures is to appear (through the action of the lure) to be a live fish small enough for a predator fish to eat. The action of these lures depends mostly upon the design, weight, lip size / angle and lure buoyancy. The results sometimes come from basic cast and retrieve, but the fisher can also vary their retrieves to create different actions from the lure, resulting in the lure becoming easier for predator fish to spot, and appearing to these fish that your lure is actually a real alive fish ready for the taking. 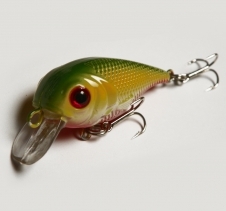 General crank baits are made of either a hollow or solid plastic with a clear lip at the front to assist in allowing the lure to dive under the water surface, the narrow end of the lure with a treble hook attached can also make hard bodies sway left and right at the rear, further creating an impression of a swimming fish. 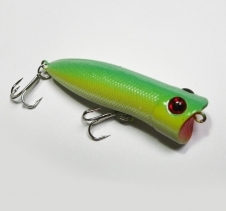 Some crankbaits also contain ball bearings to produce a slightly more varied response by shifting weight and most importantly, a positive loud and unique rattle, further assisting in getting the attention of nearby fish. When purchasing hard body lures below 4 grams in weight, we recommend using a high quality spin rod for best results. For information on how to identify quality spin rods, please refer to the "Using the right equipment" section at the top of this page. 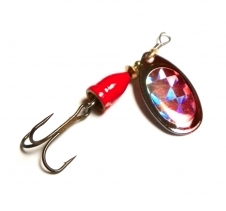 Poppers are a fishing lure in a variety of sizes and colours. The body is hollow, which keeps it on the waters surface, the head of the lure is concave and creates a rush of outward travelling water. As the fisherman jerks the rod the lure 'pops' along the surface using its concave head which in turn throws up bubbles and splashes, these actions are what makes this lure very effective. Popper lures can be used for both freshwater and saltwater species. The idea behind this lure is that it appears to be a distressed fish to a larger predator fish. When used in freshwater rivers and lakes, the lures can also appear to be a large bug, small frog or small lizard falling into the water and attempting to swim to the shore, which can entice a quick and heavy hit from the target fish. Our current range of poppers are most suited to either a spin rod or a regular / general purpose rod with a high amount of flexibility at the top. Rods specifically suited for poppers (sometimes called popping rods) do exist, however most of these are designed for the very heavy requirements of bay / ocean fishing and require a much heavier variety of popper lures which we currently do not stock. Our range of poppers are well suited to estuary, river, pier and lake fishing.